Fruits are edible from most of the Gaultheria species. 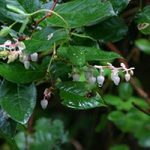 Those of wintergreen are more medicinal than edible, while salal fruits are excellent and tasty. They like an acid, moist soil and part or full shade – an excellent understorey crop. Pot grown (2 – 3 Litre).